The annual Continuity Dinner this year will be a combined Board of Directors meeting (where non-Board members have voice but no vote) and a general meeting of the Section (where all Section members have a vote, including a vote on the revised bylaws). The ACS St. Louis Section Board of Directors worked diligently over the past several months to make revisions to the bylaws. These bylaw revisions have been approved both by the ACS St. Louis Section Board of Directors and ACS National Constitution and Bylaws committee. There will be a vote by the membership to approve the bylaw revisions at the Continuity Dinner. Please address any comments, queries, or concerns about the bylaws to Donna Friedman. The charge will be $28 per attendee with a cash bar. Please contact Section Chair Joe Ackerman at ackerman@wustl.edu for late RSVPs. Reservations will be accepted through Dec 4. One of the most popular outreach programs sponsored by the St Louis Section is “Chemistry is pHun” which brings age-appropriate hands-on chemistry experiences to area elementary and high school science classrooms. Will Ridley, the coordinator of the program, is offering to train retired ACS members in the program so it can expand its reach and impact in the St Louis area. 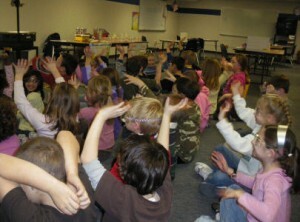 The “States of Matter” program was designed for elementary students and is popular for the 2nd and 3rd grades. Solid, liquid, and gas states are explored, mainly of water, demonstrating the addition or release of energy in the form of heat when changing physical states. “Gluep” is made to show a substance that has properties of both liquids and solids. If you are interested in volunteering or obtaining more information, please contact Will Ridley, email: ridleywp@att.net, cell phone: 314-920-1507. 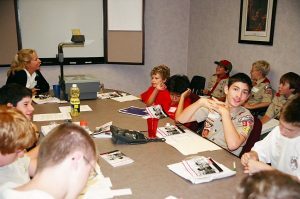 In September of 2004, 16 scouts gathered at Jost Chemical for the first Chemistry Merit badge clinic in St Louis. It was a successful experiment in many ways – the scouts explored chemical reactions and physical changes, chemicals in the home, biochemistry, reactivity series, rust, chemical careers, and much more. Both scouts and adult leaders learned a lot and had fun– so much so that it has become an annual event, spread to multiple locations, and served over 800 scouts to date. Fast-forward 12 years, to the October 2016 ACS Midwest Regional Meeting in Lawrence, Kansas. I visited the opening student poster session, and was surprised to see that the “cool” poster (as described by other students) was entitled “Microfluidic devices for the study of protein kinase activity and inhibition in single-cells”, presented by Jay Sibbitts. 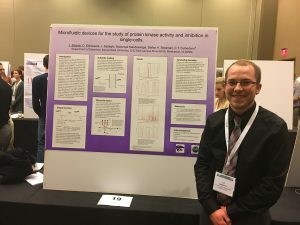 Yes, that youth who didn’t know that “biochemistry” was a word is now a graduate student in chemistry at Kansas State University. He works with Professor Christopher T. Culbertson, designing microfluidic devices that use electrophoresis and laser induced fluorescence detection to analyze single cells. By looking at enzymes of diagnostic interest, and quantifying intracellular marker concentrations, they are advancing diagnoses of illnesses such as cancer and Alzheimer’s – which they have decided is bioanalyticalchemistry, with a bit of materials science thrown in. Now that’s a word! Competitors at the first WUCT Washington University’s 2nd annual Chemistry Tournament (WUCT), to be held on April 8, 2017, is now open for registration. WUCT is an annual chemistry competition held on Washington University’s campus in St Louis, MO. The competition invites high school students from across the nation to participate in a series of individual and team-based chemistry exams, engage with college students and faculty, and earn recognition at an awards ceremony. WUCT emphasizes real-world applications of science and promotes fundamental problem-solving and teamwork skills. The first tournament was held in April, 2016, and drew 180 high school students from near and far. Organizers are planning for over 300 participants in 2017.